Heat 1 tsp olive oil and saute onions and garlic 3-4 minutes, until onion is transluscent. Add carrots, celery, potatoes, and Thai chilis for 2 minutes. Add potatoes and spices. Cook and stir until the vegetables are well coated with the spices. Add lentils, bullion, and water. Cook covered until potatoes are tender. Add cabbage, tomatoes, vinegar, salt and pepper. Cover and cook 1 hour on low. Stir occasionally and add more water if needed. 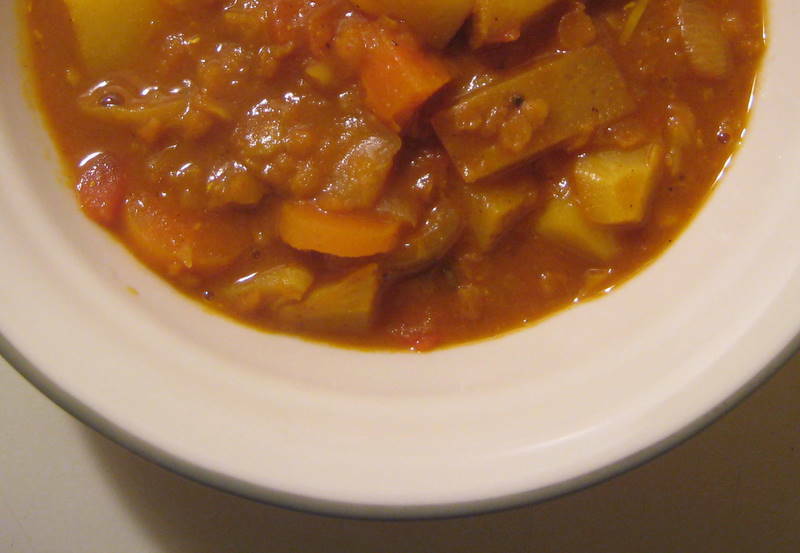 This entry was posted in cabbage, carrots, celery, lentils, paprika, potatoes, stew, vegan and tagged curry, potatoes, red lentils, smoked paprika, stew, vegan, vinegar by Beans, Figs and Katz. Bookmark the permalink. This sounds wonderful! You specify Thai chilis and I was wondering (since I have never used them before) are they especially hot or mild – or what do they particularly contribute to the dish? Does size matter? Thanks. The Thai chilis are spicy, so you could use only 1 chili for less heat, or just use a little cayenne. I hope you like it!! !